On Wednesday, the U.S. Senate Committee on Indian Affairs unanimously approved the nomination of Tara Sweeney, an Inupiaq woman from Alaska, to be the Assistant Secretary for Indian Affairs at the Department of the Interior. If confirmed by the Senate, as is widely expected, Sweeney would be the first Alaska Native to head Indian Affairs, and many in Indian Country have been watching her nomination with anticipation. Sweeney is well known in Alaska for her work on Indigenous issues, ranging from economic sustainability to tribal sovereignty. In an administration that has shown a lack of nuanced understanding of Indigenous issues, Sweeney could prove a vital advocate for Native Americans. Sweeney, whose nomination has received bipartisan support, is also an executive and shareholder of the Arctic Slope Regional Corporation. Senate Democrats are asking for a clearer promise from Sweeney that she will recuse herself from matters dealing with oil and gas exploration in the Arctic National Wildlife Refuge, which her fellow Alaskan and member of the Committee on Indian Affairs, Republican Sen. Lisa Murkowski, helped open up to mineral exploration. It is also where Sweeney’s employer owns subsurface rights. During her confirmation hearing last month, Sweeney made it clear that Native nations are not homogenous, and that dealing with sovereign nations as the unique and varied cultures and communities they are would be a cornerstone of her tenure. Past leaders of the Bureau of Indian Affairs have also held this view, but Sweeney’s perspective is significant, especially in light of the current administration. Native Americans as a whole are often seen as a monolith, rather than as the hundreds of tribes with their own histories and traditions that make up Indian Country. 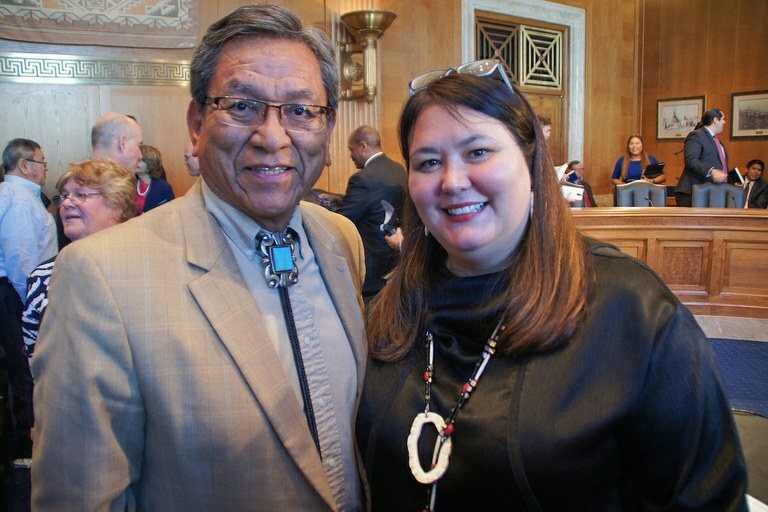 Navajo Nation President Russell Begaye poses with Tara Sweeney following her May confirmation hearing to serve as the assistant secretary for Indian Affairs. “Sweeney’s nomination comes at an important time, with an administration repeatedly calling into question the unique status of Indian tribes under federal law, either by design or mistake,” Democratic Sen. Tom Udall, vice chairman, said during the committee’s meeting on Wednesday. Udall said Sweeney could be not only an advocate for Indian Country within the administration, but also an educator. President Donald Trump’s relationship to, and understanding of, tribes is not strong. That’s clear in his administration’s claim that being Native American is merely a racial distinction and not a political one, as well as policy decisions like the large-scale reduction of Bears Ears National Monument. In addition to those issues, Interior Secretary Ryan Zinke is moving to consolidate the U.S. Department of the Interior, which oversees the Bureau of Indian Affairs. Tribal officials worry that merging the department's field offices would mean less resources for already underserved communities, and some tribal leaders have expressed frustration with the lack of consultation during the process. Whoever is confirmed to head Indian Affairs next will oversee policy changes that will affect countless lives in tribal communities across the country. Sweeney would not only become the first Alaska Native to head Indian Affairs, she would be only the second woman to do so. The first woman to hold that position, Ada Deer, was nominated by President Bill Clinton in 1993. Deer’s tribe, the Menominee Indian Tribe of Wisconsin, was stripped of its federally recognized status in 1961 as part of the Indian Termination Act, which sought to assimilate Native Americans by relocating them and removing federal support for education and health services. The county where the Menominee live quickly became among the poorest and most underserved in the state. Deer left law school in 1970 to return to the Menominee Indian Reservation and fight the policies meant to decimate her community. A large swath of Indian Country looks to Sweeney with that sentiment in mind, hoping that amid a chaotic administration often at odds with what is best for tribal communities, Sweeney will be their voice.